D-Series ROLLER CLUTCHES - Tiny Clutch | Helander Products, Inc. The D-Series TINY-CLUTCH is a miniature roller and cam type one-way clutch. It is designed to be built into the customer's equipment and has no loose parts. 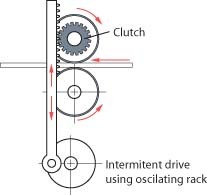 The D-Series is most frequently used to allow a driven member to overrun the input, or for backstopping a load, it can also function to convert oscillating motion to rotary motion. 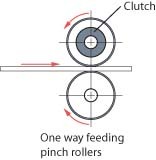 The clutch uses our proven cam and roller principle for long trouble free performance. The design of the clutch allows for near zero backlash as well as high free-wheeling speeds. The clutch will not jam in the free direction. Each roller is energized by a spring which is held square and centered in a drilled pocket. The cam, housing and rollers are made of hardened steel. The knurled hub on the housing allows installation of a pulley, gear or sprocket. The cam is screwed, pinned or keyed to your shaft & power may be applied to the clutch through either the housing or the cam. D-series Tiny-Clutches are available for shafts up to 13mm, torque loads up to 50lbs-in | 5.6Nm & speeds up to 7000RPM. We will design & build special or modified clutches for your application using stock components. Clutches can be supplied with gears, sprockets, pullies or as complete mechanical assemblies consisting of clutch, shaft and adjacent parts. * No hub on housing, housing has fixed mounting arm. please see our Special Clutches Page.